BowhuntingFair-Chase 400-Inch Bull Elk — In Kentucky? Fair-Chase 400-Inch Bull Elk — In Kentucky? When you think of pursuing monster elk, you no doubt picture the West. Some archery advice: Add the sleeper state of Kentucky to your bucket list. Lost Mountain Outfitter archery client with a massive Kentucky bull. I’ve been lucky enough to pursue elk in Colorado, New Mexico and Wyoming. And while each of those hunts was memorable, another state has me thinking that it should be added to my bucket list — and perhaps placed at No. 1. 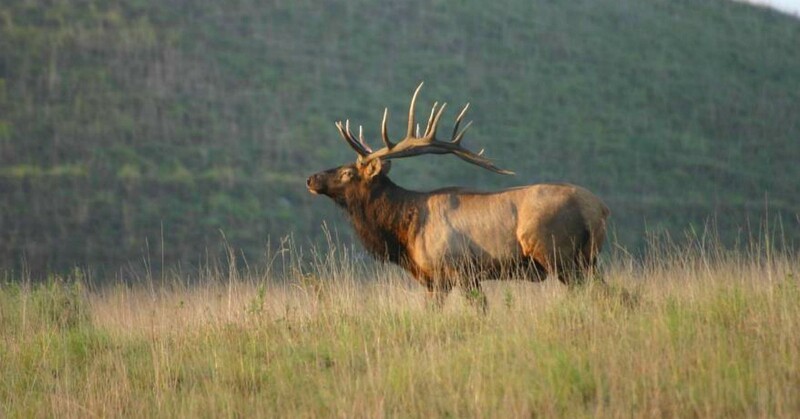 Kentucky, specifically the southeast region of the state, is home to monster bull elk. And no, I’m not talking about a high-fence destination. While the habitat looks like something home to whitetails and wild turkeys, which indeed it is, the land also holds elk. And if you’re lucky enough to draw a resident or nonresident elk tag, one person who should be in your phone’s contacts is Hurley Combs (606-271-1037), owner of Lost Mountain Outfitters. (Click here for taste of LMO’s elk camp). Quote from the LMO website: Lost Mountain Outfitters is located on the fringe of the majestic Appalachian Mountains in eastern Kentucky, and smack dab in the heart of the elk restoration zone, which covers 16 counties in the southeast region of the state (approximately 4.1 million acres). The Kentucky Department of Fish and Wildlife (KDFW) estimates its elk population is approximately 10,000 animals, making Kentucky the highest elk population of any state east of the Mississippi River. The state's first elk hunt was conducted in 2001. The population growth is well ahead of the original model, and expected to steadily increase with thousands of acres of mountainous terrain and reclaimed strip mines providing prime habitat for elk. Does that peak your interest? If not, check out the 2017 video below from KDFW that showcases gun hunter Sam Billiter and his state record bull, Kentucky’s first 400-incher, which was guided by Hurley Combs of Lost Mountain Outfitters. Pay close attention to the discussion about tag allocation and how private landowners are incentivized to work with the state on allowing hunting opportunities for the public. Good stuff. And if you’re one of those “what have you done for me lately” types of hunt researchers, then look at the images below of LMO client Corbin Ladner and his ridiculously big 2018 bull. Hurley Combs says the bull’s rack is the most massive one that has ever been taken with LMO. Rumor has it that this bull could surpass the magic mark of 400 inches; we’ll keep you posted after the 60-day drying period is over and we hear about the score. Corbin Ladner (above right) and Hurley Combs with Ladner's massive 2018 Kentucky elk. Other pics of this huge bull below. Congrats to Hurley Combs and his team of dedicated Lost Mountain Outfitters guides for putting their clients on some truly amazing animals. And kudos to the Kentucky Department of Fish and Wildlife for allowing nonresident dreamers like me the chance to apply for an elk tag. P.S. History lesson from the KDFW website: The Kentucky elk restoration project is one of the great wildlife success stories of our era. Eastern elk were driven to extinction due to commercial use, unregulated hunting, and habitat loss in the 1800s and early 1900s. From 1997-2002, more than 1,500 elk were shared with Kentucky by western states. As stated previously, Kentucky's current herd numbers about 10,000 elk.